This Salvation Road review is based on ~15 plays. Salvation Road takes place in a post-apocalyptic wasteland where you and your fellow survivors are trying to make it out of your compound and be welcomed at Salvation, the safest settlement in the area. You’ll have to work together to fight off the local marauders while also gathering enough resources to complete the journey. 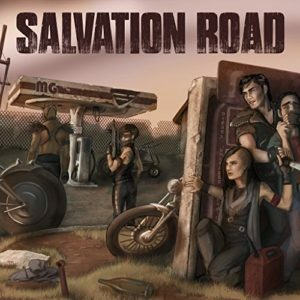 Salvation Road was designed by Peter Gousis and Michael D. Kelley and published by Van Ryder Games. This Salvation Road gameplay overview covers the 1-4 player co-op game, but there are a bunch of variants and scenarios in the rulebook that can change some of these rules. 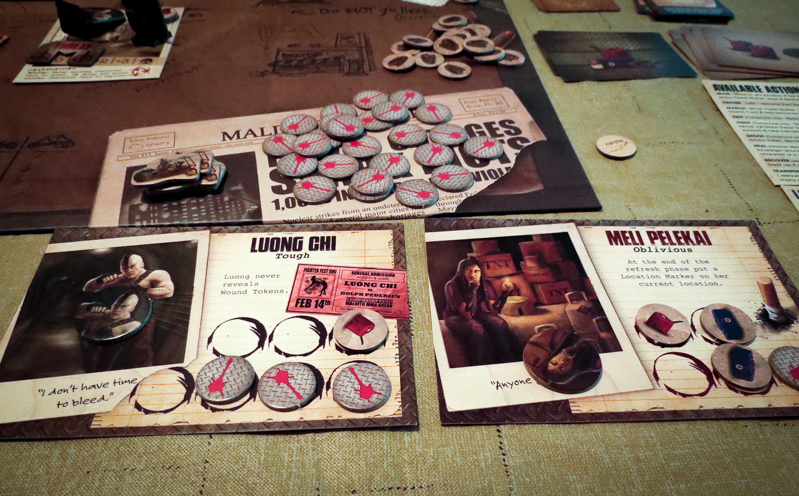 Each player gets two characters to use, a hero and a survivor. The heroes have abilities that help the team, while the survivors can slow everyone down. Most of the characters take two actions each turn. Throughout the game, you’ll be moving from location to location, picking up different resources and trying to get them back to the truck (located at your compound). Your basic actions include searching locations, gathering resources, fighting off marauders, and transferring resources to other characters or to your truck. Each location on the board has its own ability that you can use once per round. One of those locations, called the “Recon Location,” allows you to scout and explore the Road Cards, which tell you how many of each resource will be required on your way to Salvation. After all characters have taken their actions, the marauders fight back. In the Threat phase, you will roll dice to see if any of your characters were wounded by the marauders. During the Apocalypse phase, you will draw a card to see how many new marauders made it to your compound and if they wounded more people. The last phase is called the Refresh phase, which is when you either get ready for a new round or when you choose to start your journey towards Salvation. If you decide to begin the journey, you will need to pay the resources shown on each Road Card along the way. If you’re able to pay for all of those resources (with the resources from the truck) and pay for the final resources required once you reach Salvation, everyone wins! If at any point a player loses both of their characters, everyone loses. If the Apocalypse deck ever runs out and the characters aren’t ready to start the journey to Salvation, everyone loses. If the final marauder ever makes it to the compound, everyone loses. Finally, if you start the journey to Salvation but don’t have enough resources to make it, yep, everyone loses. That’s just a brief overview of how the game plays. If you want to learn more, check out the official Salvation Road rulebook (PDF). Salvation Road is extremely tough to beat… but that’s actually a good thing in this case. Not once have we played and thought that it was impossible to win. Instead, we’ve talked about actions we could have taken to increase our odds. 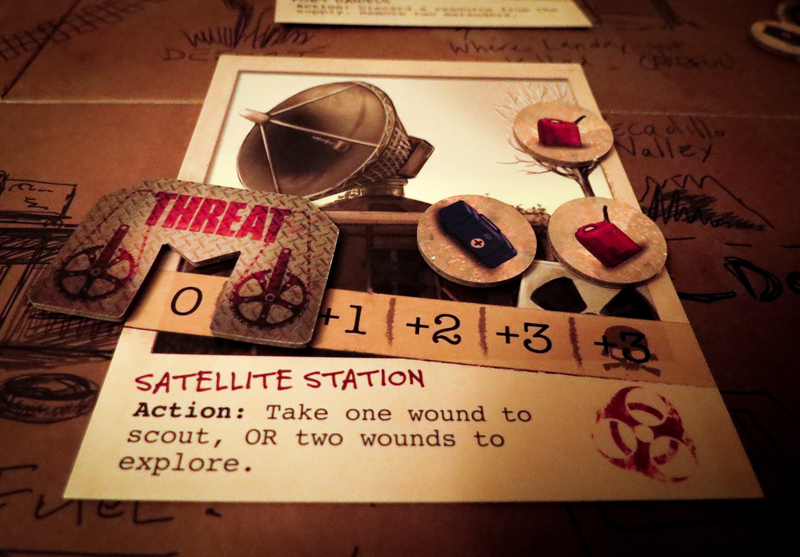 Oh, and the difficulty makes sense with this post-apocalyptic survival theme. Once you get going, there is a great flow to this game. Turns are quick and you will never feel like you’re not involved in the action (unless you have an alpha gamer in your group). The final trek to Salvation is what really makes this game different. That desperate hope that you have all of the materials necessary to make it to Salvation brings great tension to the game. The Salvation Road rulebook is excellent. I have read a lot of bad ones recently, so it was nice to have a good feel for how the game is played after only going through it once. The backstories for each character do a great job of explaining why they have good or bad traits. I recommend reading about your characters before you start each game. It’s pretty great that non-hero survivors are characters that can actually help you despite having their weaknesses. In fact, they can actually end up being the heroes! The most common complaint that I’ve heard from people who played Salvation Road was that they felt their characters didn’t have enough to do on their turns. For example, only being able to move once and pick up one resource can feel like a “wasted” turn. It’s obvious this was the designers’ way to balance the game, but it is a little bit odd that characters can’t pick up more than one item with that one action. 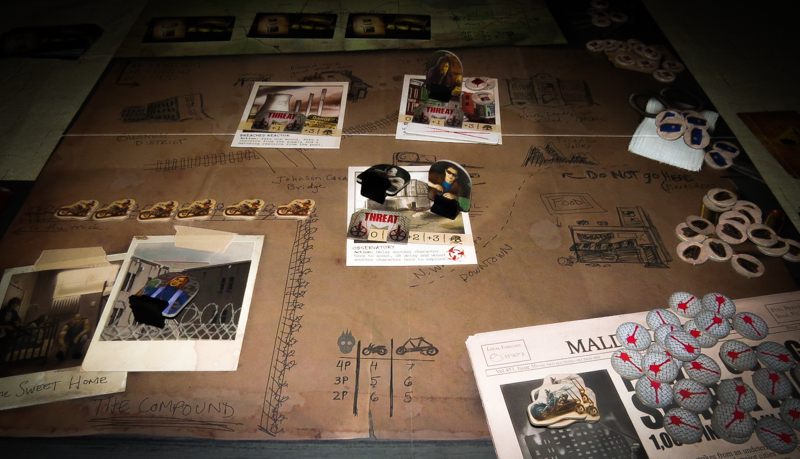 Some people might find Salvation Road to be a bit too similar to Dead of Winter. Both are survival games in which you’re moving from a safe zone (Compound in SR, The Colony in DOW) out to different locations, searching for items. The bad guys (marauders in SR, zombies in DOW) are also slowly surrounding those safe zones in both games. I personally think they’re different enough – there are no traitors in SR and there’s nothing like the journey to Salvation in DOW or any other game I’ve played – so the similarities aren’t a problem for me. Every bit of information is out in the open, which means there’s a chance you can run into the hated “quarterbacking” problem. If you happen to have someone in your group who has the tendency to take over when playing co-op games, you might want to avoid playing this one with that person. I’m really surprised that Salvation Road isn’t a more popular game. We’ve had a blast playing this one every time it’s hit the table and we usually play at least two games back-to-back. The theme is perfectly implemented and each game plays out differently, so plenty of people will get a kick out of this one. Yes, it’s kind of like a streamlined version of Dead of Winter, but we actually like that about it and are happy to own and play both. If you’re looking for a very challenging co-op, you should give Salvation Road a try. If you like the post-apocalyptic theme, definitely check this one out. The only people I wouldn’t recommend this to are those who have people in their group who like to take over when playing cooperative tabletop games. Thanks for taking the time to read our Salvation Road review!